The do-all tool that chops, minces, cubes, slices and dices with ease. Make easy work of your dinner prep with the 1 Second Slicer - the do-all tool that chops, minces, cubes, slices and dices with ease. As Seen on TV, this convenient kitchen essential contains easy-to-change cutting inserts for five different results to make preparing healthy and delicious dinners a breeze. And the five-piece tool takes up little counter and storage space for an added bonus. The extra sharp blades of this handy slicer are made of hardened stainless steel in G-Nox quality for professional slicing and dicing. Slice potatoes, dice onions or make a delicious fruit salad in just seconds, and easily transfer your food or store for later use with the transparent container that can hold up to 3 cups and a fresh-keeping hinge lid. You&apos;ll love all the extra time you have in the kitchen. 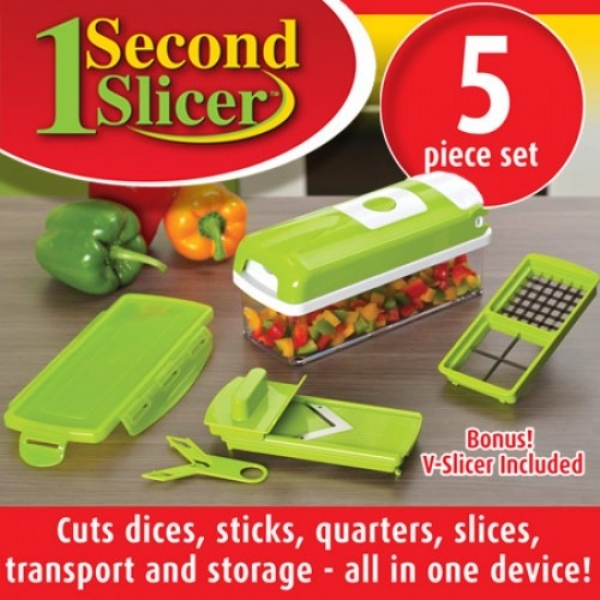 The 1 Second Slicer includes a cutting insert for medium cubes/sticks and quarters, and a slicing insert with blade protector and food holder. Details:No more tears onion chopping. Storage lids for freshness and stacking ease. Simple cleaning under running water and dishwasher safe. Effortless change and space-saving storage of different lids Ideal to use on meats, fish, eggs, fruits and vegetables. Huge capacity, but is no bigger than a loaf of bread. BPA free. 1 Second Slicer includes: One hinged cutting lid, One clear storage container, One stainless steel insert, One snap-on fresh keeping lid, One 1 Second V Slicer, 30-Day Money Back Guarantee. We LOVE this thing! We use it every day. We have sugar gliders and this works perfectly to prepare their meals and makes they food the perfect size. It saves me loads of time every day. We also use it to make our salads, cut potatoes, really everything we can think of. It is so much more sturdy than my old one. It is easy to clean. I love the little push button cleaner. The only thing I can think of that I dislike is I wish they had a blade that had a little smaller holes also. The slicer/chopper is amazing. I can prepare a whole salad in minutes. It not only slices, but it dices all kinds of vegetables. 28 people found this helpful. Was this review helpful? 19 people found this helpful. Was this review helpful? I thought it had a drop in blade that would slice just like the cube one. I was disappointed. Wouldn&apos;t that be cool? Just to push down and have slices? Does a great job and ealily also! Works well, but the dices are not small enough for my liking. Works great,handy for salads and soups, excellent for slicing and dicing a cold plate. Only suggestion I have is to make the v-shaped slicing blade adjustable, you may not always want paper thin slices on your tray. My wife really loves it!! Saves tears on onions. Taco fixins are easy.